Single handle pressure balancing mixing tub and shower unit, ceramic control cartridge with stainless steel balancing piston, built in reverse connection capability, (To reverse the hot and cold inlets simply remove cartridge and turn 180º), two service stops/check stops, and adjustable limit stop. 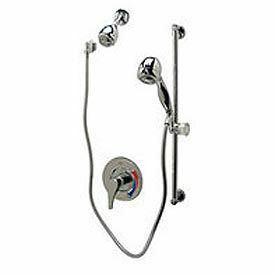 Speakman® Handicap Shower And Tub Combination Systems Are Used For The Hospitality Industry, Gyms, Hospitals And Home Use. 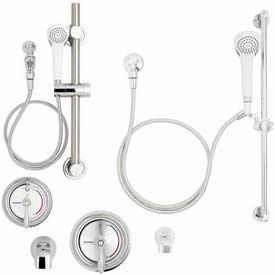 Handicap Shower And Tub Combination Systems feature polished chrome plated brass trim with a metal index plate for vandal resistance and long lasting durability. Systems are designed for logical ease of use in any environment. Temperature can be adjusted through precise temperature limit stops and valves feature a ceramic temperature-regulating module that provides high quality, anti-scald, pressure balanced protection. Valves are ADA compliant. Available in Anti-Scald, Thermostatic Pressure Balance, Anti-Scald w/Diverter and Thermostatic Pressure Balance w/Diverter in a wide variety of styles and combinations. Dreamline™ Shower Columns Turn Ordinary Showers Into A Efficient And Stylish Spa Experience. Dreamline™ Shower Columns are made of aluminum, satin aluminum, acrylic and ABS for long lasting durability. 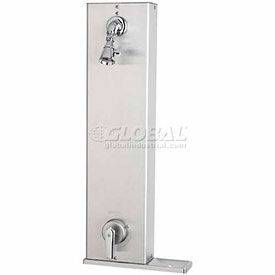 Available in different styles and colors to fit any bathroom design. 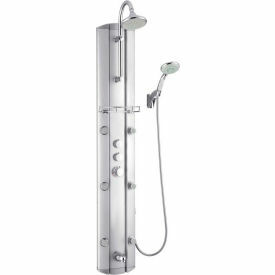 Features include hand held shower, adjustable body massage sprays, large rain shower head and individual water controls. Easy installation with only hot and cold water connections and fast mounting on wall-attached brackets. Types are Hydrotherapy and Jetted. Color finishes are Aluminum, Aluminum In-Satin and White. Dimensions vary per type.